Through Catholic Charities and other ministries, dioceses throughout Texas are providing basic humanitarian and pastoral support to thousands of Texans affected by Hurricane Harvey. The Texas bishops are coordinating efforts with Catholic Charities USA and local civic authorities. This page will be updated as the situation develops. At this time financial contributions provide the greatest immediate aid. 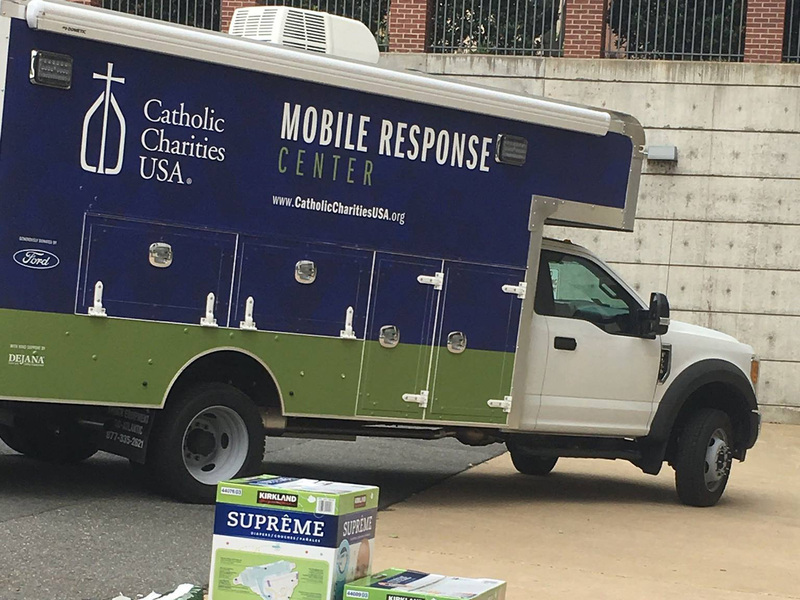 Donations of cleaning supplies, nonperishable food, infant supplies, toiletries, new underwear and socks, insect repellent, gift cards for food and gas, and other items are being collected by Catholic Charities outside of the impacted areas and being delivered in a coordinated manner. Please see below for ways to donate either through your local Catholic Charities or through a Catholic Charities in an impacted area. Do NOT attempt to self-deliver donations or services to the flooded areas. It is not safe! 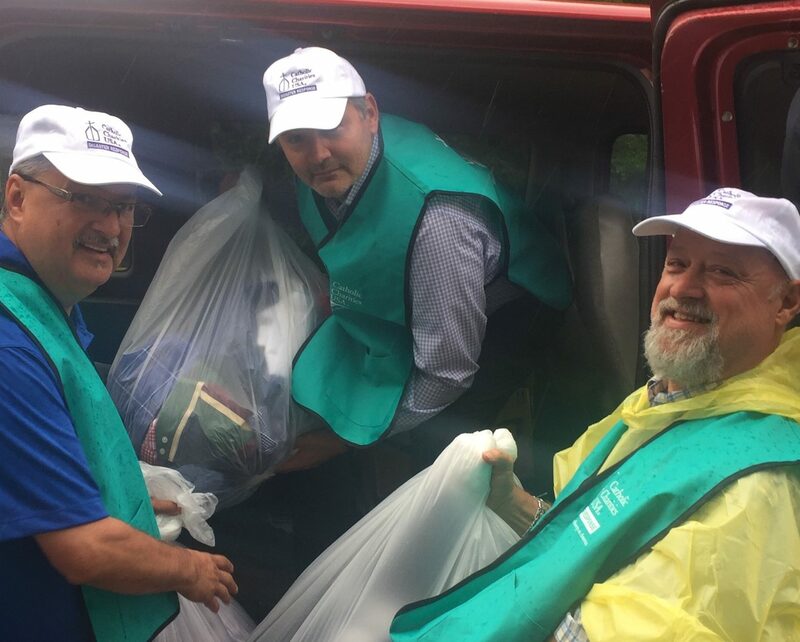 Volunteers: In preparation for deployment, we are seeking names and contact information for volunteers willing to lend their time and talent to our Disaster Response program. Volunteer roles will range from administrative to direct work with families impacted by the flood. If you are willing to volunteer with us, please email Claire Bordelon. Financial donation: Gift cards to Wal-Mart and H-E-B in $25 and $50 denominations are most needed. Families are going to need food, clothing and shelter. The most effective way we can help families is raise funds and then empower families to regain some sort of normalcy by being able to purchase their own food items, clothes, etc. In short, financial donations cut down on hidden cost and prevent delays in getting families exactly what they need to begin the recovery processes. Services: For anyone impacted by the floods, please call our Disaster Number at 512-766-7111. Catholic Charities of Southeast Texas is accepting donations online through Network For Good. Coordinated deliveries of food and water is being done by Jefferson County officials. Gift cards (Visa, Target and Wal-Mart, in $25/$50/$100 amounts), cleaning supplies (mops, buckets, gloves, masks, garbage bags, chemicals and bleach) and personal hygiene kits (deodorant, soap, toothpaste and toothbrush) are being requested and can be sent to 2782 Eastex Fwy, Beaumont, TX 77703. These items are also being shipped in by Catholic Charities from Dallas, San Antonio and Brownsville. Please contact those organizations if you wish to coordinate delivery of goods into the Beaumont area. The following items are being requested: CLEANING SUPPLIES & BLEACH, canned goods,water, diapers, baby wipes, disposable baby bottles, work gloves, charcoal, lighter fluids, lighters, small pits, insect repellent and gift cards to H-E-B, Walmart, Lowe's, Sutherlands and Valero. These items may be delivered to 615 Oliver Ct., Corpus Christi, 78469 Monday - Thursday, 7:30 am - 5:00 pm. These items are also being shipped in by Catholic Charities from Dallas, San Antonio and Brownsville. Please contact those organizations if you wish to coordinate delivery of goods into the Corpus Christi area. Catholic Charities in Corpus Christi is also accepting online donations. Catholic Charities' Client Services Center is now open at 2900 Louisiana, Houston, 77006. It will be open on Saturday, Sept. 2, and Monday, Sept. 4 from 9 a.m. to 1 p.m., and is accepting donations. Donations of school supplies are urgently needed, along with non-perishable food, diapers and other infant supplies, cleaning supplies, new underwear, toiletries, etc. These items are being shipped in by Catholic Charities from Dallas, San Antonio and Brownsville. Please contact those organizations if you wish to coordinate delivery of goods into the Houston area. The Archdiocese's Catholic Charities also accepts online donations. Volunteers are needed for a myriad of tasks. Please use the online form to sign up. Checks payable to Diocese of Victoria may be mailed to 1505 E. Mesquite Ln, Victoria, TX 77901. Please write “Hurricane Harvey” on the memo line. Please also donate online; their needs are great. Donations are being accepted and coordinated deliveries being provided to the affected areas. Estimates of 500-800 evacuees are in the Rio Grande Valley. Checks can be sent to Catholic Charities of the Rio Grande Valley, PO Box 1306, San Juan, TX 78589. Please write “Hurricane Harvey” on the memo line or donations can be made online. Gift cards for Visa in $25 and $50 amounts are requested. Catholic Charities of Dallas accepts online donations and is receiving evacuees. – Supporting donations and shelters locally (two shelters have been authorized in Tarrant County). This includes cataloging needs for food, shelter, and clothing. – Deployment to the Texas Coast on an as needed basis. This is contingent on state officials, with a target date of 9/11. This includes canvasing door to door to understand needs and input people into the FEMA system. We are looking for people who could commit to a two-week deployment with 72 hours notice, multiple deployments are available. Interested individuals should complete this form. For other questions, or if you are an evacuee in need of aid, please call 682.321.8512 or email harveyhelp@ccdofw.org. Donated goods are being delivered to affected cities, including Corpus Christi, Houston and Victoria, and provided to evacuees. Items requested: bed cots, blankets, pillows, diapers, baby formula, bottled water, canned food, can openers, gift cards (Home Depot, Lowe's, BP, H-E-B and Wal-Mart, in $25 and $50 amounts), cleaning supplies (mops, buckets, gloves, masks, garbage bags, chemicals and bleach) and personal hygiene kits (deodorant, soap, toothpaste and toothbrush). Donations are being accepted at 1801 W. Cesar Chavez San Antonio 78207. Catholic Charities of the Archdiocese of San Antonio is also accepting online donations. Catholic Charities of the Texas Panhandle is accepting donations online. Checks payable to the Diocese of El Paso can be sent to P.O. Box 17993, El Paso, TX 79917. Please write “Hurricane Harvey” on the memo line. Catholic Charities - Diocese of Laredo is accepting online donations. Catholic Charities of Lubbock is accepting online donations. Checks may be sent to Catholic Charities of Odessa, 2500 Andrews Hwy, Odessa TX 79761. Catholic Charities East Texas is accepting online donations. Please find below downloadable documents for parishes and communities for a Holy Hour of prayer and Eucharistic adoration. Those unable to come to a church or organized service are invited to pray wherever they are in solidarity and spiritual communion.